The Executive Director of the Texas Commission on Environmental Quality (TCEQ) in Austin signed an emergency order on Friday removing the manager of the Thunderbird Bay Water System. Brown County Emergency Management Coordinator Brent Bush said that manager Charles Shram has been removed as water system manager. “A temporary management company has been appointed to operate the system for 180 days after which time a judge will determine who will take it over on a permanent basis,” Bush said. Bush said that representatives of the temporary management group and TCEQ met at the lake site on Saturday to begin the changeover process and to do an initial inspection of the water system facility. TCEQ is expected to release more information on the changeover next week. Bush also said that as of Saturday morning, it appears that water is flowing to the homes at the north lake areas at normal pressure. Although water is flowing, the quality is not good and residents are under a boil water order. They hope that the quality will improve as water continues to flow through the system. Many residents of the subdivisions lost all water service on May 30th. Emergency water supplies have been provided to the area by the North Lake Volunteer Fire Department and many volunteers. The subdivisions of Thunderbird Bay, Harbor Point, and Tamarack Mountain have been struggling with water outages since last Sunday afternoon. Although many residents of the area have seen their water supply improve, some still have little or no service. Brown County Emergency Management Coordinator Brent Bush said that as of about noon Friday, most of Tamarack Mountain and Harbor Point have running water, but areas of Thunderbird Bay have very little or no water pressure. “The latest issue at Thunderbird Bay was a break in a large line that was repaired last night,” Bush said. Bush said that they hoped to have the line repaired and pressured back in late Friday. Many residents in the Thunderbird Bay area have expressed frustration at the situation. Bush had the State send a TTST (truck tractor semi trailer) load of 22 pallets of bottled drinking water to the North Lake Brownwood Volunteer Fire Department Tuesday night. The Early High School athletic director and about dozen students arrived in the area to help unload the water. More water was expected to be delivered on Friday. The North Lake Brownwood Volunteer Fire Department has been delivering drinking water to homes and also pumping “fire truck” water into buckets so residents can flush toilets. Residents of the areas who do have running water are being told to boil it before use. Water stained; 70 degrees; 4.99’ low. Black bass are excellent on Grande Bass Rattle Snakes, Bass Hogg spinnerbaits, and craw colored crankbaits in 4 to 5 feet. Hybrid striper are slow. White bass are excellent on Li’l Fishies, small Rat-L-Traps, and shad colored crankbaits. Crappie are excellent on Li’l Fishies and tube jigs along shorelines in the Pecan Bayou and Mountain View areas, and along the 279 bridge in 1 to 3 feet. Channel catfish are good in baited holes in 5 to 10 feet. Yellow catfish are good on trotlines baited with perch. The Memorial Day weekend found many north Lake Brownwood residents without water. Subdivisions of Thunderbird Bay, Harbor Point and Tamarack Mountain all suffered through the weekend without the luxury of running water. North Lake Volunteer Fire Department distributed water to residents by transporting water in their fire trucks to fill bathtubs, sinks and toilets for residents to have enough water for simple necessities. They also distributed much needed bottled water for drinking to the residents provided by emergency services throughout the outage. Another resident said they were hoping it was just a pump problem that could be fixed once the part came in. To many resident’s relief, approximately 9:30am Wednesday, water was in the process of being restored to the area. A Texas Commission on Environmental Quality representative was on scene checking on the situation. They are advising that residents should boil water before use. The water pressure should increase and is expected to be fully restored by Thursday. More than 1,000 permanent residents of North Lake Brownwood at Tamarack Mountain, Harbor Point and Thunderbird Bay are receiving emergency supplies of bottled water after the storage tanks that supply the system that furnishes water to those homes ran dry Monday afternoon. Brent Bush, emergency management coordinator for Brown County, said he received a call from the regional office for the Texas Commission on Environmental Quality in Abilene right after lunch Monday. A shipment of 20 pallets of bottled water was scheduled to be sent to North Lake Volunteer Fire Department Tuesday evening, Bush said. The Brownwood-Brown County Health Department and the county’s emergency coordinator gathered donations and sent the bottled water to the North Lake Brownwood Fire Department to be handed out to the elderly and sick until a shipment from the state could arrive, Bush said. Residents of the affected neighborhoods can pick up bottled water at the North Lake Fire Department. Housebound residents may call the fire department and request that water be delivered. Bush said he and three representatives from the TCEQ’s regional office had tried to meet with the owner and operator of the water system on Monday evening, but that did not happen – even after they waited for three hours. Bush said because he didn’t have access to the facility, he could not determine what was wrong with the water system. Bush said he did meet with the owner Tuesday morning and was told that the 185,000-gallon storage tanks would take 24 hours to fill. However, the TCEQ must decide whether the tanks need to boil the water before it is distributed to the public. Bush and TCEQ officials met with representatives from the homeowner associations of all three areas Monday evening, and they made an official request for the state to furnish water. With crowds flocking to Lake Brownwood for Memorial Day recreation, the family of a missing Hill County man has asked people to be on the look-out for Richard Parker, 76. “Pay close attention to the area if you’re at the lake,” the missing man’s son, Daniel Parker, said in a telephone interview Saturday. Richard Parker went missing from his Hill County home on April 24, and his vehicle was found two days later in the Lake Brownwood area. Richard Parker, who has dementia, was described as 6 feet 2 inches tall and weighing approximately 190 pounds. He was last seen wearing a short-sleeved plaid shirt, dark blue jeans, a ball cap and tennis shoes. The missing man’s vehicle was found at the Mountain View Lodge and Marina on April 26. There was no record that he had checked into Mountain View Lodge. The only connection Richard Parker has to Brown County is that he stayed on the camp grounds many years ago. Richard Parker may not be wearing the same shoes in the description. The owner of a mobile home at Mountain View discovered April 30 that someone had entered residence while no one was home, had gotten into bed and had opened several soft drinks. The intruder also left a pair of black tennis shoes. “We are not sure if he changed his shoes or is not wearing shoes,” Daniel Parker said Saturday. The lake around the area has been dragged, and the Brown County Sheriff’s department has continued to search, but the trail has run cold. Anyone with information that might lead to Richard Parker’s location is asked to call the Brown County Sheriff’s Department. “Any new information would help,” Daniel Parker said. Authorities are no longer searching for Richard Parker on foot, but are following up on all leads called into the Brown County Sheriff’s Office. Parker, 76, was last seen at his home in Acquila, Texas last month. 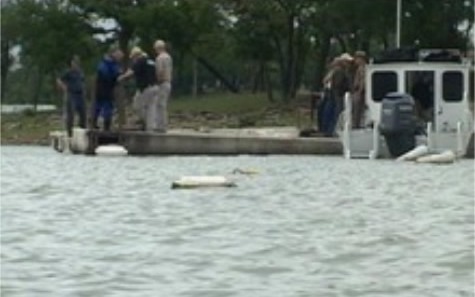 His pick up truck was located close to Lake Brownwood. Parker is 6 feet 2 inches, weighs about 190 pounds, and was last seen wearing a short sleeved plaid shirt, dark blue jeans, black tennis shoes, and metal framed glasses. White bass are excellent on Li’l Fishies, small Rat-L-Traps, and shad colored crankbaits. 76-year-old Richard Parker has been missing for over 2 weeks. Today law enforcement began a diving mission for Parker’s remains, but his children say they aren’t giving up hope. “My dad was a hard worker, proud man, I think the onset of the dementia I think he was aware of what was going on and I think it frustrated him,” said Parker’s son, Richard. Parker’s family says he seemed to have been struggling with his medical conditions which include, type 2 diabetes, dementia, and high blood pressure. “I think he grew ever increasingly frustrated with his condition I think he had a hard time understanding it and I think that’s probably what led to Saturday evening, (his) driving off,” added his son. Parker was last seen on April 25th, at the Mountain View Lodge area of Lake Brownwood. Jackie Elliot says she comes to the lake twice a month, and on May 1st, she returned to her camper and was very surprised at what she saw. “Dr Peppers that were opened and some sitting around, the bed was unmade and there was a pair of tennis shoes that from what I understand, belonged to that gentleman,” said Elliot. Authorities believe Parker may have spent at least one night in Elliot’s camper, since the shoes match the description his family had given. “I was really angry when I came down and found out that somebody had used our camper without our knowledge and now I feel really bad about that because I had no idea,” added Elliot. A crew of over 40 people searched the waters and grounds for several hours, but were unable to find any sign of Parker. Parker’s family says they’re incredibly grateful for the efforts made by law enforcement and also for the support they’ve received from the community. “There is still that possibility that he’s out there somewhere. We still don’t want folks to turn off their radars and if they see something that they think might be able to help us whether it’s someone in Abilene or someone that has information, please continue to report that to the authorities,” said Parker’s son, Richard. Anyone with information about Parker’s whereabouts should contact the Brown County Sheriff’s Office at (325) 646-5510. Kohler Co. in Brownwood Makes Massive Layoffs - San Angelo LIVE!